When does Season 9 of The Walking Dead begin? We now know thanks to the trailer released this morning — October 7! What has Comic-Con revealed about the upcoming misadventures of Rick and crew? We won’t lie. Compared to the conflict from last season, this feels like a downgrade. After the imminent threat of a fascistic dictator taking control of the entire community and making everyone miserable forever, having to go back to zombie threats again feels downright quaint. But as former showrunner Scott Gimple repeatedly said in the past, and current showrunner Angela Kang is saying now, this season is the start of a new storyline for the series. It takes place after a time jump, and it can’t go from zero to sixty instantaneously. 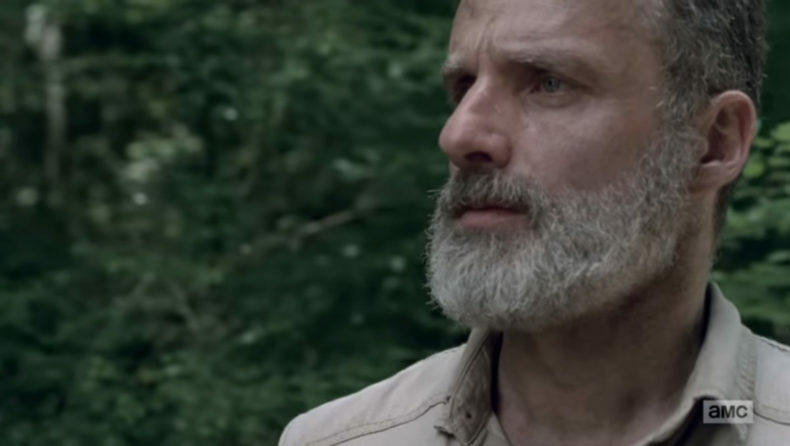 There are intriguing questions and plot threads in the works, but they’re enhanced unintentionally by the known departure of Andrew Lincoln at the end of Season 9A. The conflict and friction that’s been brewing between Rick and Daryl is sure to come to a head very soon, especially after this hinted episode where Rick gets his face bashed in with a pot. Rick is also not getting along with Maggie after he let Negan live, so the question hanging over this season is: will one of them become fed up enough to arrange his demise? While it’s possible he could also simply trip and fall into a pit full of Walkers, that would be anticlimactic. Oh, and…Maggie had her kid offscreen, of course. Lauren Cohan never had to wear a fatsuit. Perhaps this was her plan all along. The Walking Dead Season 9 begins October 7 on AMC.